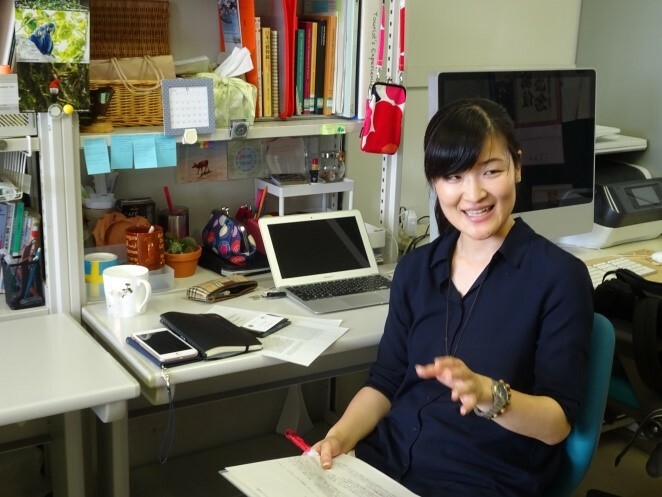 In this interview, I would like to introduce to you Mrs. Rie Usui, who is pursuing her PhD at the Graduate School of Integrated Arts and Sciences at Hiroshima University. She belongs to the Taoyaka Program for Creating a Flexible, Enduring, and Peaceful Society, a five-year integrated PhD program. Motivated by her passion to create an animal-friendly society, she incorporates an interspecies vision from human-animal studies into her work on tourism. 研究者を志したきっかけはなんですか / What made you pursue a research career path? Several female researchers have influenced me during the course of my life. Originally, I wanted to become a primatologist. When I was in the fourth grade, I first saw a gorilla named Koko communicate with human researchers on TV using sign language–the event that got me interested in non-human primate species. I began gathering information about primates and related research. I soon learned about Dr. Jane Goodall and Dr. Dian Fossey, who inspired me to pursue a career in research. Another female researcher who played an important role in my life was Dr. Lori Sheeran, my academic advisor at Central Washington University in the United States, where I obtained my master’s degree. She was such a genuine person, and she became my role model as a researcher, teacher and mentor. 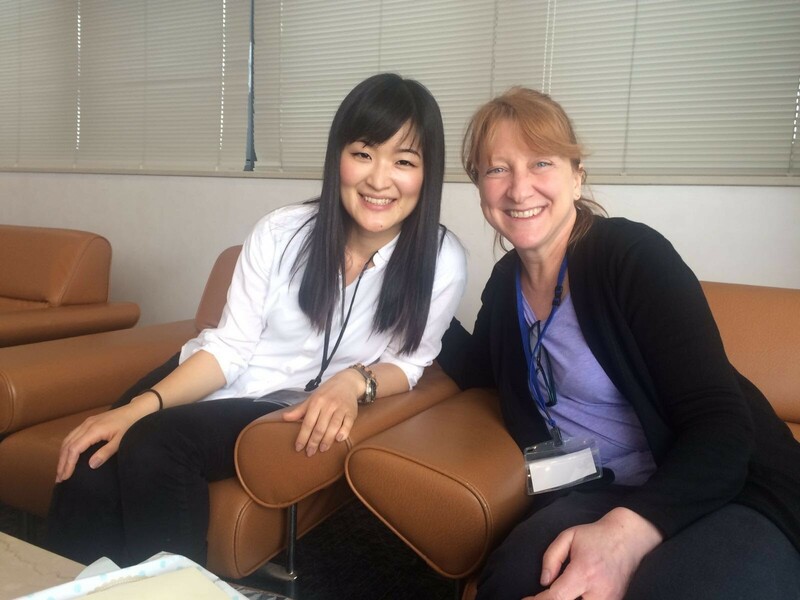 Dr. Lori Sheeran and I at Inuyama in Aichi when she visited Japan for the first time. I keep in touch with her even after I graduated from CWU. どんなことを研究されているのですか / What is your research about? I mainly conduct research on wildlife tourism, a type of tourism in which tourists encounter animals, or related fields. Generally, tourism is a human-centered activity. My vision and hope is to expand the moral consideration of animals, who are exploited for human benefit or entertainment. In my dissertation research, I use a political ecology approach to unpack how people perceive deer on Miyajima and Yakushima Islands, and how the deer are framed within a human political system as a result. I analyze discourse taken from interviews and wildlife management plans to achieve my objective. In the end, I hope to propose suggestions on how we can best work together to create tourism landscapes that balance the needs of humans and animals. 普段どのような生活を送っているのですか / What is your daily life like? Lately, I’ve been trying to be more conscious about balancing my study/work and leisure time. I used to keep myself in the lab pretty much all day long to study, but I realized that I wasn’t being productive. I believe that giving myself some time to enjoy other activities actually helps increase my work productivity, so I go to a pottery class twice a month to give my brain a rest from studying. Aside from doing my research, I work five hours a week at the university writing center as a graduate student tutor. This job not only helps improve students’ writing skills but also advances my own skills in writing. I try to take advantage of available writing opportunities at the university as much as I can. For instance, last semester, I joined a writing group. Every Friday for two hours, participants exchange comments on each other’s papers. This has helped me keep up with my writing and polish my paper. Other than my own dissertation research, I’ve been working on projects with scholars from other universities. In May of 2018, I visited Jigokudani Monkey Park in Nagano and conducted interviews regarding the community’s challenges associated with international tourist growth. Also, I’ve been attending the Wildlife Tourism Conference, which is held in Australia, since 2015. I have been asked to partake in a new project with scholars whom I met at this conference. たおやかプログラムではどのようなことをしているのですか / What do you do as a TAOYAKA student? The Taoyaka Program is a five-year PhD program. In the third year of the program, students from the three different courses–Cultural Creation, Technical Creation, and Social Implementation– form a team to work on a project for about a year. Team projects can be conducted at “disadvantaged” regions in Japan or overseas. My team began a project in October 2016 in Mitarai in Kure City. 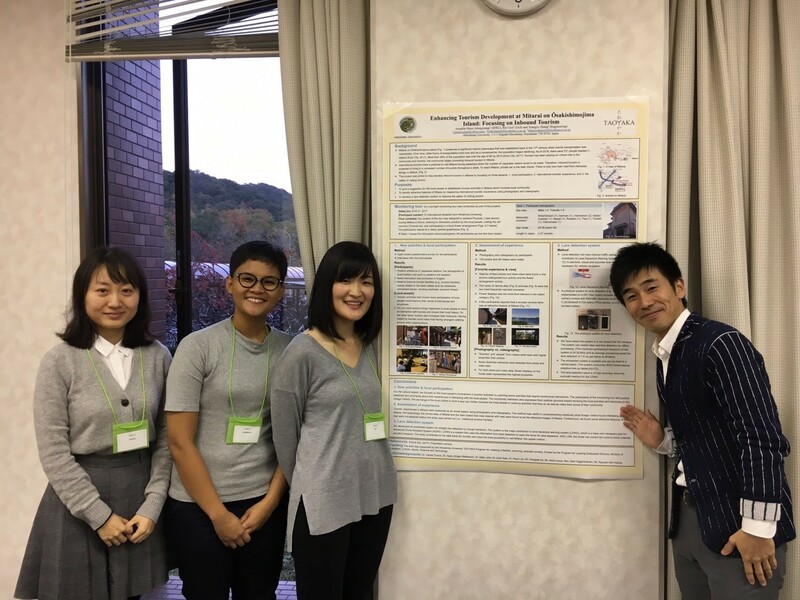 It wasn’t easy working with my team members, who had dissimilar research interests, but we were able to somehow focus on the development of inbound tourism in Mitarai. We conducted a small tour in Mitarai and shared our results with the community at the end of the project. プロジェクトの最終発表会にて。活動中にお世話になった井上さんとチームメンバー / With my team members and Mr. Inoue who helped our project. 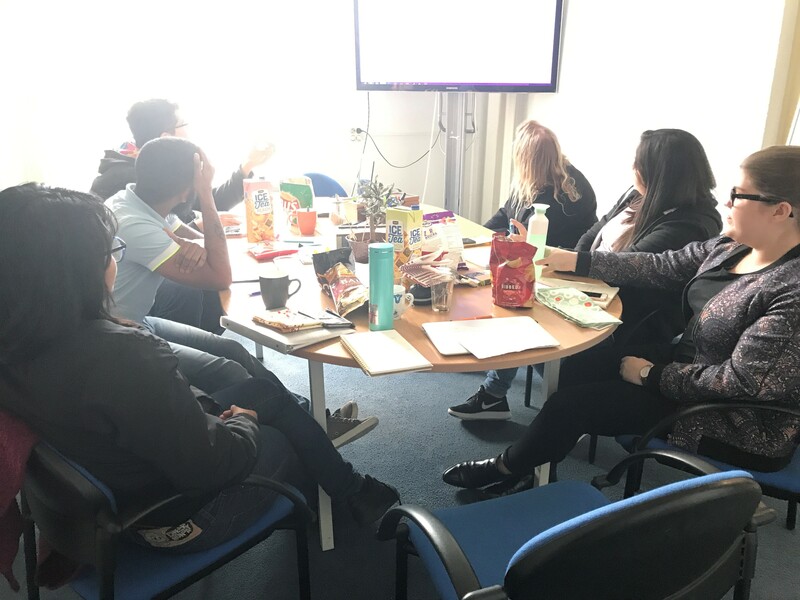 インターンシップ先でのミーティングの様子/ Weekly meeting at IIAE.